At the HIGH END trade show in Munich, Germany (May 10th – 13th, 2018), visitors will be able to experience the first Trinnov Audio device that supports the interactive and immersive audio format MPEG-H 3D Audio and showcases the advantages of object-based audio. Turning down the volume of the commentary in a sports broadcast in order to achieve a true stadium atmosphere; being able to better understand the dialogue in an action movie by softening background noise effects; enjoying a TV movie with 3D sound, as if one were watching it in a theater. These are just three of the advantages of MPEG-H 3D Audio, a format substantially developed by Fraunhofer IIS. At the HIGH END trade show in Munich, Trinnov Audio, a French manufacturer of high-quality audio processors and controllers for HiFi, home cinema and professional applications, will show for the first time an MPEG-H demo on an Altitude 32 home cinema preamplifier. The award-winning device will be equipped with MPEG-H support as a standard feature by a software update available later this year. Trinnov Audio and Fraunhofer IIS have been working together as two of the ten partner companies and institutions from four European countries in the EU research project ORPHEUS (Object-Based Broadcasting for European Leadership in Next Generation Audio Experiences). Within this project, the partners work closely to develop, implement and validate a new, object-based end-to-end radio transmission chain. For this IP-based chain, ORPHEUS uses international standards such as ADM (“Audio Definition Model for metadata”), BW64 (“Broadcast Wave including audio essence and metadata”), MPEG-H 3D Audio, and MPEG-DASH for adaptive streaming. The goal is to make object-based audio content available to a broader audience without additional cost. Other ORPHEUS project partners include: Eurescom (Germany), BBC (UK), Institut für Rundfunktechnik IRT (Germany), Elephantcandy (The Netherlands), b<>com (France), IRCAM (France), Bayerischer Rundfunk BR (Germany) and Magix (Germany). At the HIGH END show in Munich, Trinnov Audio’s demo will highlight the interactive features of MPEG-H. At booth A4.2 – F203, visitors will be able to experience some of the object-based audio contents that have been released for the ORPHEUS project, in a very high fidelity environment. 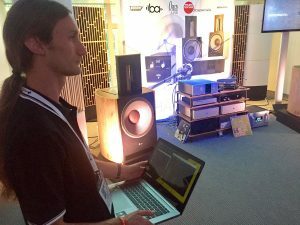 Trinnov Audio managed to deliver the highest sound quality possible on a 4.2 loudspeaker setup.